Time and again, we always talk about communication, on how important it is, how effective should it be… really, what is the big deal about it? I can tell you how bad things can go with lack thereof. And of course, recountal of bad is generally hilarious. The tenth results were out that day. And there were interviews of the toppers – and what they wanted to become in their lives as they grew up – all over the TV. Well, first of all congratulations to the deserving students. Who knows, really! But does everyone know what is the process of teaching that goes into the production of such toppers? First of all, good-scoring and bright students are identified and selected in the fag end of 8th or starting of 9th standard. Along with the 9th standard text books students are made to buy the 10th syllabus books the previous year itself. 10th standard portions are taught two years in advance. The revision exams start as early as quarterly/half early in the 9th standard. Hence by just attending these exams you will be able to blurt out answers even when woken from sleep. 10th standard students are forbidden from taking part in cultural activities. Students are offered hostel facilities during that crucial year. When I was in 8th, my fellow students thought that I should feel privileged that I will be one among those taking special classes. Why are students subjected to this torture? There is a promise the school management gives to parents that they will make sure their ward will get greater than 1100 out of 1200 assuredly. What do the schools gain out of it – increased probability of a state rank, name and fame to the school. And once the results are out, the Correspondent will give a talk to the press and media, the script being written down by the school’s English teacher, and proof read by a student, probably. It happened back in those days, I wonder if it does even now. I heard that 499 is the first mark out of 500, I wonder whether the new aim is to get 501? They say travel is glamorous only in retrospect. Maybe so. Because we rush doing things in the present that the actual experience is invariably recollected and nourished only. But what if we are able to retrospect in the middle of the travel! I had been to a four day trip to Kerala, when things were not really looking up with respect to my daily life. It was Day2 in the Kondai Lip resort. Let me give a description of the place to you. It is something of an island, a few cottages surrounded by backwaters on all sides. A pond right in front of our room and benches along its brim. I really needed time alone and was looking out for a spot to settle down. Cottage porch- strike out; pond benches – strike out (they were wet); dining area – strike out; I finally settled on a slanting coconut tree after checking for bugs. When I was staring at the full moon and thinking of the ways of the universe, Sarayu came along and volunteered to narrow it down for me. It was pitch dark and I was already seeing mirages. We slowly started talking. First, it was the plops of fish, then the croak of frogs. Then we saw men in dhothis rowing boats, a bevy of swans and then that pink flamingo, gracefully standing with one leg up in the waters, patiently waiting to pick its meal. Or maybe it wanted some alone time, just like I did? Not really sure. A little ahead of the canal was a strip of land lined with trees. I was trying to figure out the tallest tree. She said the farthest, but I thought that could be parallax error. And then further ahead was this mansion… her mansion. 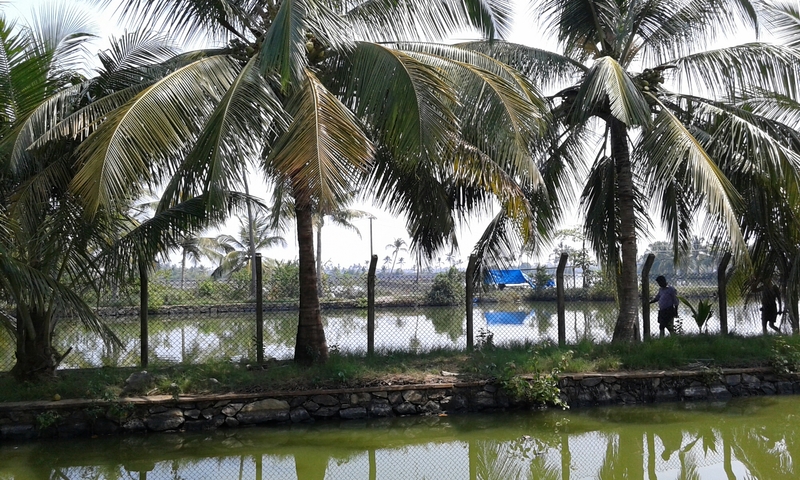 A house flanked by tall coconut trees, I think it was the backside facing the waters. You enter through the front which connects to the road, maybe has a car park. As you cross the living room there is a spiral staircase winding up. You take it and reach the master bedroom. Shall I say, the master mattress room, more likely. It is a room that has been plush-carpeted and nil-furnished; where you can lie down with a book or have a chat over a coffee, facing the canal behind. Music in low volume would have been really nice. “What’s the time? Oops… its 2 already.” “I think we should go in and catch some sleep… atleast for tomorrow’s sakes.” And all the visions vanished in thin air, as we trailed back to our room.